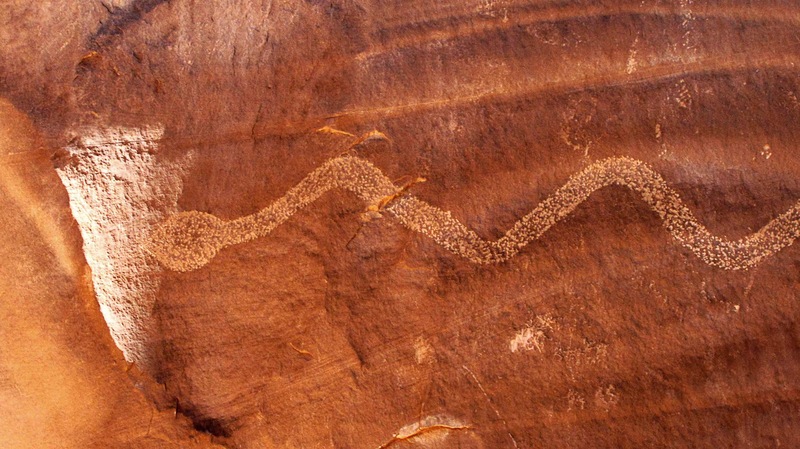 This petroglyph is called The Summer Solstice Snake. An arrowhead lights up on its head for a few seconds on the solstice. I spotted the scales on the snake skin shimmering in the Summer Solstice sun as I was hiking with a friend on the Earthquake Trail in Point Reyes. It was exactly 21 days after I had moved to California. I was thrilled to find a perfectly intact skin left behind by it's former owner near the edge of the path. It seemed like the perfect gift since the Summer Solstice is my favorite day of the year and I had been comparing myself to a snake shedding the skin of my old life due to a patch of skin that had been mysteriously and inconveniently peeling for weeks. My friend and I were on our way to Toby's Feed Barn to see the brilliant and vastly entertaining visionary activist and astrologer, Caroline Casey. When we arrived, all of the chairs were filled, so we perched on straw bales. I have never seen her before and was immediately entranced by the exquisite eloquence of this purple haired raconteur. 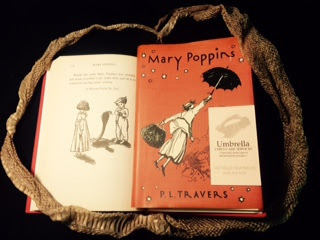 I was further enchanted when she began talking about Mary Poppins (my alter ego since childhood) and proclaimed the original P.L.Travers version of this iconic nanny to be a shaman. But when she recounted the story I had long forgotten, about how Mary Poppins received a snake skin as a gift from a wise and powerful snake on her full moon birthday, I was as open mouthed with wonder as Jane or Michael Banks after one of their nanny's magical tricks! This is the snake skin I found and my copy of Mary Poppins open to that story with my former business card from when I was a nanny finder that reads "practically perfect pop-in and permanent providers"
Perhaps I was predisposed to be impressed by this synchronicity since I had experienced what felt like Solstice magic earlier in the day. You may recall from a previous post, the story of my mystical experience connected to the labyrinth I had found in the desert. 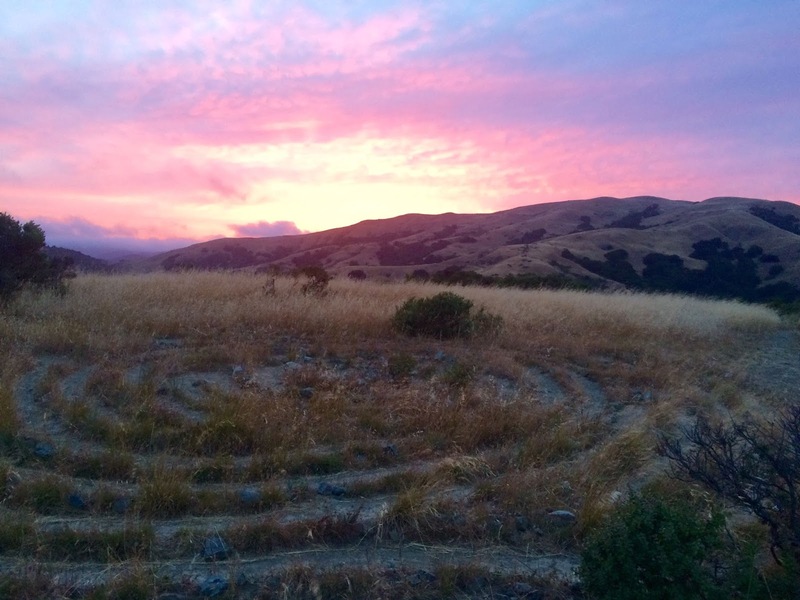 I had set out that morning to see if I could find a labyrinth near my new home so I could celebrate the solstice in a sacred spot. My housemate said she thought there might be one in Fairfax. So I drove to Fairfax to the natural food store where I saw a bunch of the kind of people who looked like they would know where a labyrinth would be, sitting out in front of the store on benches. One guy pointed vaguely westward and said he was pretty sure there was a trail that led to one at the end of one of the streets a couple miles up on the right hand side. I went right past the street he probably meant (I did not think I had gone far enough), which would have taken me me there fairly directly, but found another one with a trail head at the end and started hiking. There were several choice points where I had to decide randomly which way to go, and I pretty much gave up the idea that I would find what I was looking for. I decided I would just enjoy the day and hike until I ran out of time. At one point I walked right by the labyrinth on a path just below it and only by chance took a different way back when I turned around to try and find my way back to my car. So how is the story of my Solstice synchronicities relevant to YOU and your, perhaps, distinctly UN-magical feelings around a challenging transition (past, present or future) in your life? Be patient, I promise I will get there. First one more story that just happened after I posed the above question to myself on your behalf. I was inspired to tell you the Solstice stories, since they fit in with the chronological timing of the ongoing narrative of this blog as well as this year's upcoming Solstice. When I finished these anecdotes, I was trying to decide which of the several directions I was going to go, to end this post in a way that would be meaningful and helpful. I decided that since I was writing about synchronicities, It would be fun to ask for synchronistic guidance. I closed my eyes and reached blindly into the middle of the pile of about 50 books that I am currently reading or have recently read and am still referencing. The first words under the chapter title were "I finally understand that others don't need me to fit into the club of the ordinary. They need me to fit into my own skin and ignite the radical possibilities in all of us. I've been so afraid of being different. But everyone else is different too. They have genius, love, and wild untapped potential within them. They may just not know it yet." At the bottom of the page were the words "Maybe you're still chasing kudos to glue some sequined wings on to your hobbled back. But no amount of approval will ever set loose the inspired potential that you already possess. You have the power to shed your ordinary skin. You have the power to turn flesh into hope, disconnection into union, and this moment into a balm to some section of humanity. Of course the snake and skin references got my attention (! ), but in addition, I got an inspiration based on this weekend's synchronicities and insights for a chapter in my book that is now bubbling boisterously on the back burner. I think I will call it "Sparkly Wings and Gypsy Balm". These were the wings I wore while making fairy houses this weekend at a local festival and the balm from "The Sultry Gypsy" which is one of the many potions I used to completely heal the ankle I sprained while making those pixie pads. Okay, so let me wrap this up. Back to the snake at the top. When we are pierced by an arrow of change, whether it is a painful unexpected one, something that we knew was coming or perhaps a shot from Cupid's bow, it is a precious moment of opportunity. Rather than armor ourselves, we can be open and willing, allowing it to help us transform. As Leonard Cohen sings, "There is a crack in everything, that's how the light gets in. " (click the link to listen to his powerful lyrics and some view some gorgeous images). I have been sharing my ongoing story since the day my life was cracked wide open, including all of these weird, woo woo synchronicities, in the hopes that as I share my experiences it will help those of you who are feeling the kind of despair that I felt, to find hope and inspiration. And also give you permission to open up to the mystical realm that is available to all of us. I definitely fall into the category of "your average garden snake that needs just a bit more therapy than your average garden snake"! I shed the skin of my old life and rewrote my story into one of gratitude and celebration. And I have read countless accounts of others who started with even more handicaps than I have and who had far worse implosions. So I know this is possible for anyone. We are ALL engaged in an ever unfolding personal evolution with occasional Sparks & Leaps of transformation. 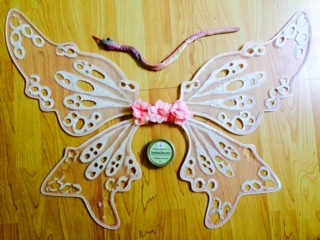 As the Hamadryad Snake in the Mary Poppin's story says "We are all one, all moving to the same end." Together we can support each other to be courageously present in the powerful light of those pivotal moments. Happy Solstice - enjoy the longest day of the year and the light of our beautiful sun! I will be celebrating the Solstice this year with my dear friend in the photo (below) who is getting married that day! I will also be remembering a wedding I was once planning to take place on a long ago Solstice and the way that break up broke me open and sparked enormous beneficial life changes. And it is Father's Day, so I will be gratefully remembering my dad and his gifts to me. And I will be sending love to all who read this post! Living in the Midwest and not able to make it to a sacred ruin? Try this one in Iowa! 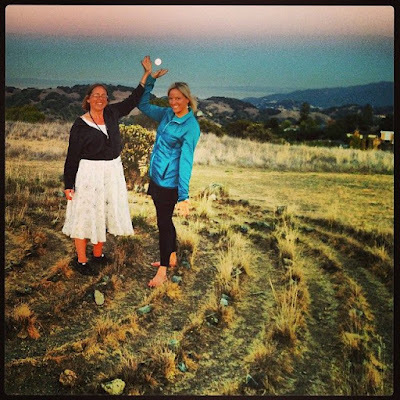 This photo is from the labyrinth on the night of an eclipse. *Tama Keives also says "any road can take you in the right direction". This works for my hunt for the labyrinth and finishing this post and of course life in general - but sometimes the route can be serpentine! Thanks for reading and responding, Jori! Lovelovelove YOU! Happy Solstice! This comment came in my email and I wanted to share it here with my response: "I agree with you, every path is the right path, if you make it so. But on the journey, shouldn’t there be some down time as well, to just wallow in the muck, if only for the moment it takes to realize that every single thing that happens is just one sliver of living?" MY RESPONSE - Yes, their absolutely needs to be down time and lots of it! Wallowing in the muck is one way and it does have it's uses, but I think if you are going to do that, do it with conscious intent. Say "I am going to wallow for the next hour" (or some defined time period) Totally go for it. Exaggerate it to the point where you can see the humor in it - even if dark humor! And YESYESYES, EVERYTHING is "just one sliver of living" and needs to be acknowledged and fully experienced! Well, someone needs to comment here, so I am going for one more! 😏 I told you about the synchronicity of Tama Kieve's book and here is another one from this morning. She has a book entitled "a Year Without Fear" with a different entry for every day of the year. The entry for today, June 17 is "Maybe you're going through a time of transition, and you wish it was over. Everybody wants to rush through transition like it's a bad root canal. The transition is at threshold. It's a sacred life appointment–the crossing from one identity or world to another. Let go of your resistance and you will meet uncanny power. Transition, if you choose, is a way of priming for your next level of potency."